Native of Wilna; died at Frankfort-on-the-Main March 23, 1712; son of Rabbi Aaron Samuel Kaidanover; pupil of Joseph ben Judah Jeidel, rabbi of Minsk and later of Dubno. Rabbi Joseph's teaching exercised a considerable influence upon his pupil, especially in the cabalistic trend of his studies; whereas in the Halakah, Kaidanover followed more closely his father. In his native place Kaidanover, with his whole family, was thrown into prison on account of a base denunciation, and was forced to languish in chains for years until he was pardoned, his son being retained in prison at Slutsk. Fearing another imprisonment, he decided to settle in Frankfort-on-the-Main. In Frankfort he recovered from the trials through which he had passed and found leisure to engage in literary pursuits. Besides publishing his father's works, which he in part accompanied with notes (as in the case of "Birkat Shemuel"), he wrote a book on morals entitled "Ḳab ha-Yashar," being a combination of ethics and asceticism. It has passed through numerous editions since its first appearance at Frankfort in 1705. The book contains 102 chapters, corresponding to the numerical value of . "Ha-Yashar" is an anagram of the author's name ( ). Kaidanover also made a Judæo-German translation of his work which has often been published together with the Hebrew text (as ed. Sulzbach, 1815). A similar book on morals was written by his son-in-law, Rabbi Manoah Hendel Kirchhahn, under the title "Simḥat ha-Nefesh." 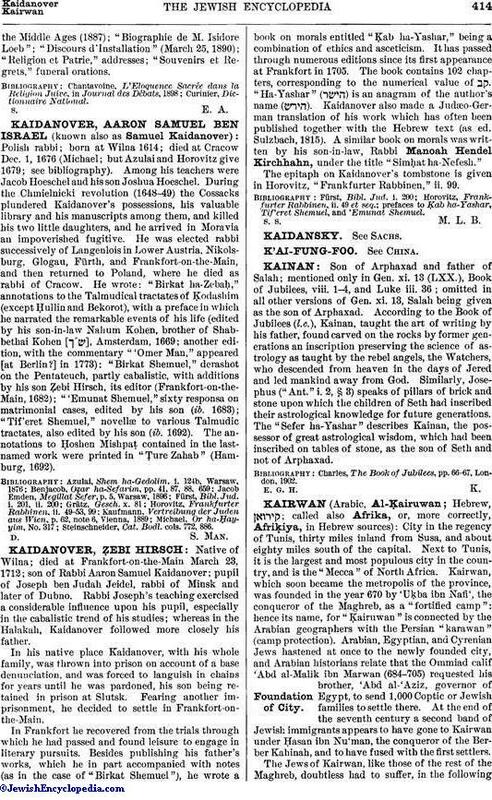 The epitaph on Kaidanover's tombstone is given in Horovitz, "Frankfurter Rabbinen," ii. 99.
prefaces to Ḳab ha-Yashar, Tif'eret Shemuel, and 'Emunat Shemuel. S. S. M. L. B.